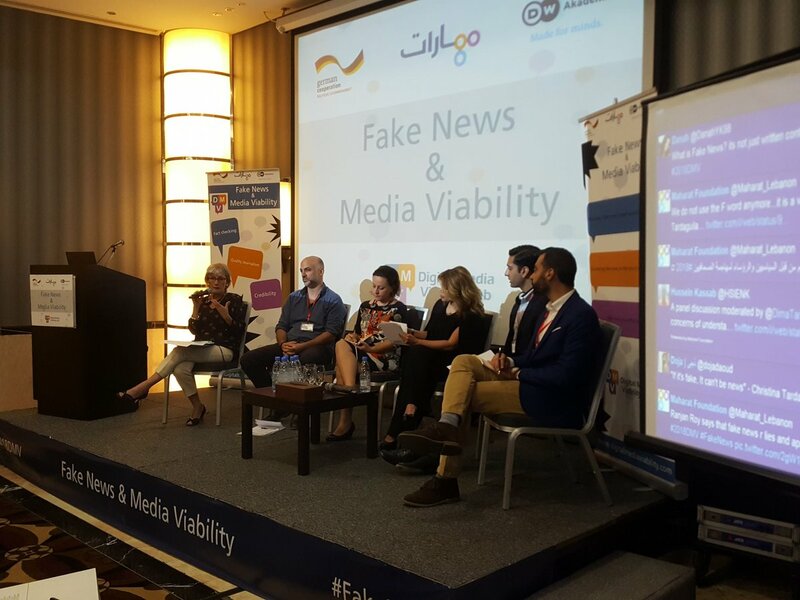 Today Maharat Foundation launched the international conference on “Fake News and Media Viability” organized jointly with Deutsche Welle Akademie between the 24th and the 26th of April, 2018 at Crowne Plaza Hotel- Hamra, Beirut. The 3 days conference is aiming at discussing the arising issue of fake news and the way media is dealing with it. This conference is organized within the framework of the “Digital Media Viability Lab” initiative which aims to provide concrete solutions to the problems media institutions are facing in the digital age, and how to approach viability by supporting innovation to help develop future ready business models that can create and distribute quality content. The conference started with a welcoming note from Sandra Van Edig, the country manager in Lebanon of Deutsche welle Akademie; and from Roula Mikhael, the executive director of Maharat Foundation, who emphasized the timing of the conference that is coinciding with the parliamentary elections in Lebanon, the time when fact checking is mostly needed from media. Sylvie Coudray, the Chief of Section for Freedom of Expression at UNESCO- France made a presentation about fake news and freedom of media where she considered that there is no unified definition of “fake news” and the term comes under information chaos. A session was held about the meaning of fake news around the world, where experts and journalists discussed the definition of fake news and how its meaning differs among countries. This session was facilitated by Dima Tarhini, a senior anchor and editor at DW Arabic. The session engaged an interactive discussion between the audience and Rami Rhayem, a reporter at BBC-Lebanon, Ranjan Roy, the CEO of The Edge Group in USA, Cristina Tardáguila, the director of Agência Lupa in Brazil, and Sayed Torky, the executive editor in chief of Al-Menassa in Egypt.